This PDF is Password Protected. Please call 1-780-962-7996 for the password or use the DEFAULT password supplied with every XTA unit. What's the square root of 9? Xtel International Ltd, formed in 1989, is a Canadian telecommunications engineering company manufacturing and marketing XtelAlert ( XTA), a state-of-the-art data and voice alarm monitoring/control product which reliably protects remote or unattended assets at temperatures of -40C to +60C. This allows for low power usage since no heaters are required to keep our equipment running. XTA is approved by CSA/NRTL, Industry Canada, and FCC. >> DOWNLOAD THE PDF HERE. XTelAlert (XTA) has evolved into a fully programmable product, easily customizable for a variety of unique applications for voice callout and/or data exchange via cellular, two-way radio, telephone, or satellite. XTA information is heard via your communications device by your staff allowing them to instantly determine what action to take to protect your facilities and keep production running. Data logging by the XTA over a period of time can be transmitted to your offices anywhere in the world as a CSV file providing trending information for strategic decision making. XTA gathers its information via binary or analog inputs and each can be independently configured to match your unique operations. XTA applications include the monitor and control of petroleum processing plants, waste treatment plants, lift stations, radio transmission sites, electrical sub-stations, irrigation systems, air navigation landing systems, tank farms, rail transportation, telecommunication facilities, fire and security, electric drive monitoring & control - providing a smart and easy-to-use communication interface for VSDs at well sites, monitoring and control for non-powered sites. 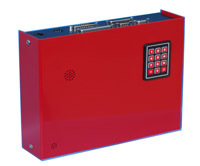 The XTA will accept any standard and specialized sensor input for alarm monitoring. We also now produce quality-integrated assemblies for interfacing independent power producers ( IPPs ) to major utilities. Please download our model information sheet for more details and look at our application sheet for some examples of the XTA at work. The XTA product is constantly being refined as our clients come to us with new ideas. If you should have an idea, we would like to hear from you. Xtel International Ltd. is experienced in a number of design and technology areas including radio communication system integration, project management, object oriented software development, microprocessor and electronics design, electronic manufacturing, sourcing, assessment, evaluation, testing and commissioning. Xtel's engineering team employs the latest in proven technological design tools to produce reliable, cost-effective system solutions for difficult applications. Xtel international has the facilities and experience to mount, wire and intercable your next Telecom construction project. Overhead cable trays, -48Vdc power supply, work space for your engineers, shipping and receiving of equipment and custom fabrication. We can take the project from conception to commissioning or work with your people to assure that the equipment you install works when it gets to the site. Rack mounts, cabinets or cases, we can install your Telecom equipment to the highest standards. Give us call before you start your next project and then drop by to see our facilities. All content © 2007 Xtel International Inc.